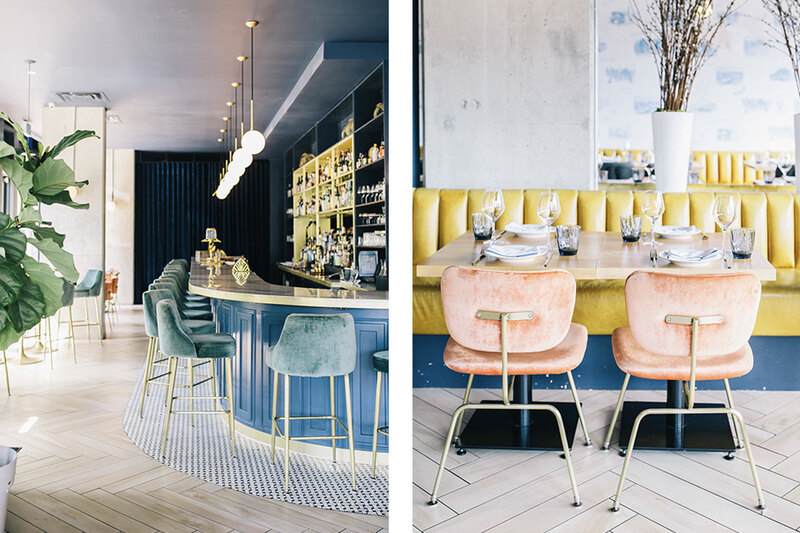 A while back, we rounded up eight of Toronto’s most sought-after restaurants based on their interior design. Unsurprisingly, in the last 12 months, the trend has continued with even more dining destinations drawing locals and visitors in with great lighting, impeccable design, and, of course, delicious food. If you’re walking through Little Portugal, it’s nearly impossible to miss SoSo Food Club. The building’s pink and teal exterior is enough to draw any curious onlooker inside where the colour palette continues. Inspired by the vibrancy of Hong Kong, where owner Nancy Chen is from, you can expect the food to be as Instagrammable as the interior. 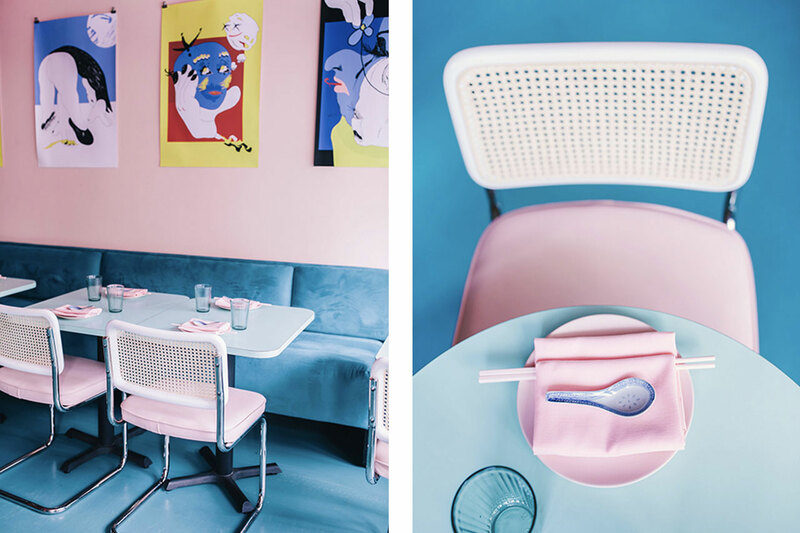 Aside from the colour scheme, SoSo Food Club features a cozy mid-century modern seating area and an impressive colourful neon installation. If you’re up for a little late night entertainment, stick around after dinner. This restaurant turns into a dance club on weekends and is the perfect spot for private bookings and special events. 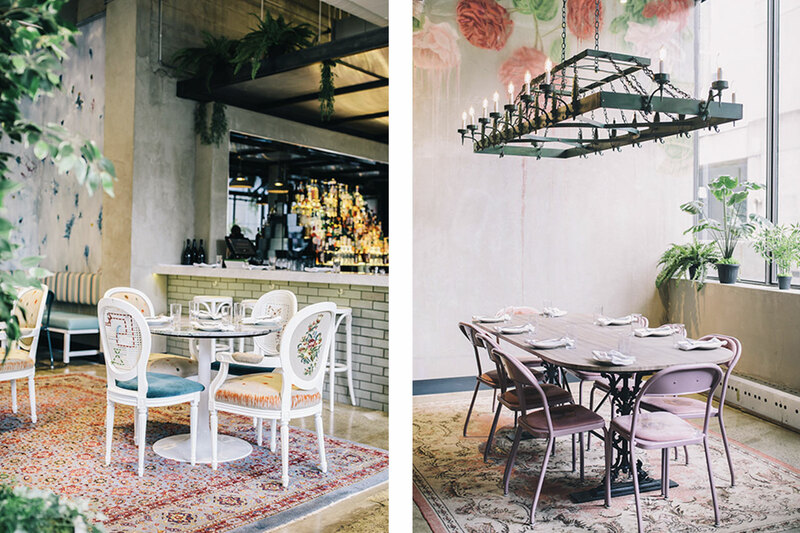 Nestled between West Queen West and Liberty Village is the relaxed, neo-bistro Bacchanal. 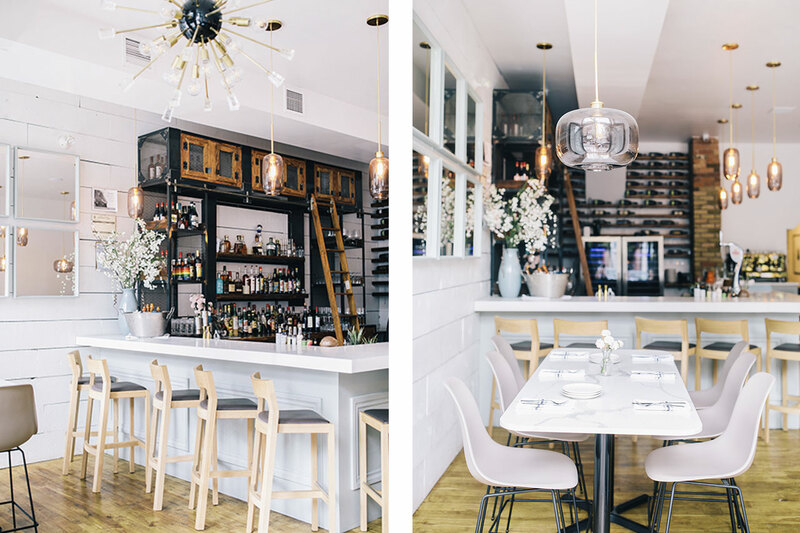 This naturally-lit bistro has a similar perspective on interior design as it does the food they offer; modern, yet classic. Order up a French-inspired cocktail, or an “off menu” absinthe, and snap a photo at the sprawling brass bar that features an eye-catching tiled floor and blue velvet bar stools. For a more relaxed setting, cozy up in one of the tufted canary yellow booths; preferably by the bright blue statement wall. Upon first glance, the mural looks like classic French toile, but after closer inspection, it’s actually a heartfelt nod to Toronto. One of the newest restaurants on our list, Bar Altura offers a modern Italian vibe in the heart of Queen West. This light and airy space, with floor-to-ceiling windows that remain open on warm nights, gives off a welcoming feeling. 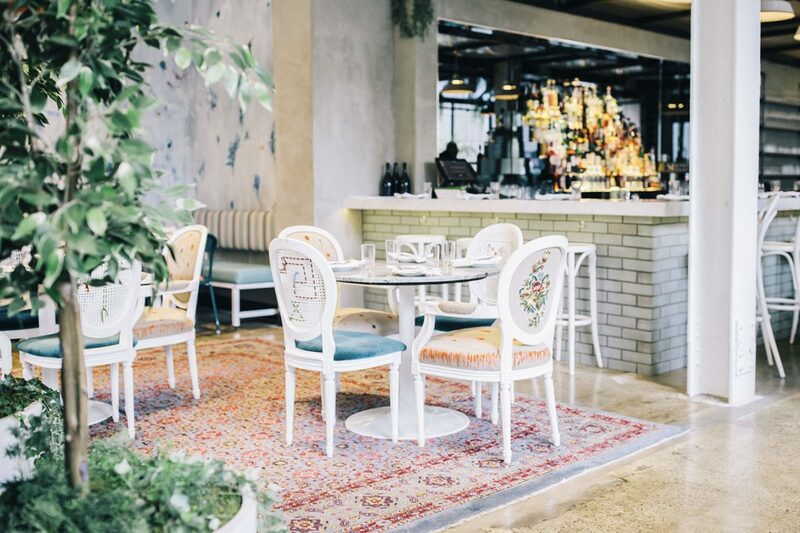 The ideal spot for someone with a bright-white Instagram aesthetic, Bar Altura features a mix of marble and natural wood, like shiplap and barnwood walls, and a pastel blue bar that gives off a modern farmhouse feel. Pared down elegance at its finest, Bar Altura is the perfect spot if you’re in the mood for fresh pasta or want to grab a craft cocktail before heading out to a late dinner. Blink and you might miss it. In fact, if it wasn’t for the bright pink door and neon sign, you likely would. However, once you find yourself inside Chubby’s Jamaican Kitchen, both the delicious Caribbean cuisine and bold interior design are tied for what will keep you coming back for more. This restored 1890 row house was gutted to expose the original rafters and beams. 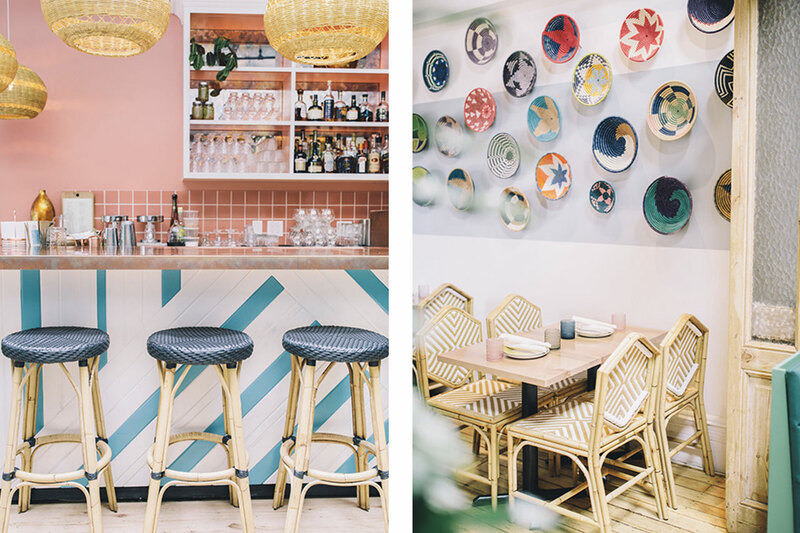 After the renovation that included an extension, the owners added vibrant colours, textures and shapes to reflect a tropical Caribbean experience. Some unique design elements to note are the geometric blue and white tiled bar with a pink wall and tiled bar back, handmade bamboo chairs, and an abundance of live plants that bring the outdoors inside. Located in the heart of Toronto’s Financial District, Rosalinda is a vibrant, vegan Mexican restaurant with unmatched ambiance. Upon entering Rosalinda, you can’t help but direct your eyes to the vaulted metal ceiling that doubles as a greenhouse. You’ll notice rows of hanging plants in between green pendant lights that trickle from the ceiling all the way down the windows. Along the window ledges are even more lively plants reaching for the sunshine that comes streaming in. You’ll also notice the vintage feel this restaurant gives off with several antique rugs and a variety of reupholstered chairs working together to create a bold statement. Tucked in the back, you’ll find a family-style table with intricate wrought iron legs, perfect for a large group outing. It’s anchored by a near perfect-match wrought iron chandelier, and purple metal chairs with roses printed on the seats. Naturally, to match, a rose mural has been painted on the concrete wall. We can always count on The Drake to come up with new, creative experiences in the city. Their latest project, Drake Mini bar, sits directly across from Drake One Fifty and is the ideal hang out, especially with the 55-seat patio open during summer. 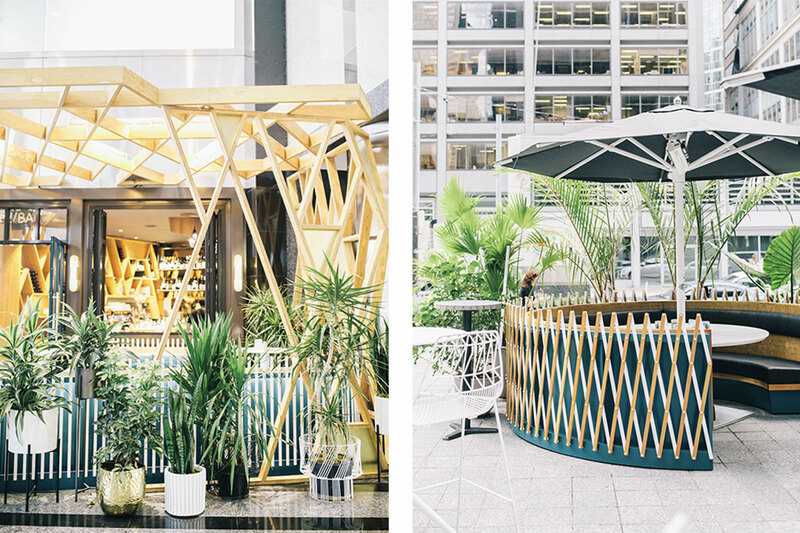 Drake Mini Bar feels like a small oasis smack dab in the middle of the Financial District thanks to a vibrant colour palette, geometric wood elements and massive plant installations designed by Toronto’s own Brothers Dressler. Inside Drake Mini Bar, you’ll find commissioned artwork from Toronto-based Rajni Perera, which includes a sprawling wall mural and painted table tops.